Flowering plants or angiosperms (Magnoliophyta) make their first unmistakable appearance during the Early Cretaceous (140 MYA) (Kenrick & Davis 2004, p. 195). Thus, angiosperms appear 300 million years after the first vascular plants and 220 million years after the first seed plants (Willis & McEwain, 2002, p 156). Angiosperms underwent a rapid adaptive radiation soon after their first appearance. In fact, angiosperms became the dominant flora across the globe by the Paleogene a mere 70 million years after their first appearance. Flowering plants continue to dominate the world’s flora today; extant pteridophytes species number 10,000, gymnosperms 750, and angiosperms up to 300,000 species. These new seed plants possessed a number of important characteristics that separate them from other seed plants. Flowering plants evolved distinctive characteristics that help to define this plant division. Angiosperms possess flowers, develop fruits, contain specialized conducting cells in their vascular tissues, develop a double-layered seed coat, exhibit a distinctive column-like structure in their pollen grain walls, and undergo double fertilization during their life cycle. The fertilized egg will undergo cell division to become a zygote and then an embryo. The second fertilization results not in offspring, but rather the development of endosperm, which acts as a nutrient for the embryo. Cells in the endosperm have three sets of chromosomes. Endosperm not only serves as an important food source for the embryos of flowering plants it also is important to other animals. Humans depend upon the endosperm of rice, wheat, and corn. Recent research indicates the endosperm may also act as a fertilization sensor helping to abort embryos of incompatible crosses (Juniper & Mabberley 2006, p.27). Traditionally angiosperms are divided into the monocotyledons and dicotyledons. Today angiosperms are divided into the monocots, eudicots, and magnoliids. Monocots and eudicots are monophyletic groups. Eudicots contain most of the dicots. It is useful to known the major differences between monocots and dicots (eudicots & magnoliids) when studying both extinct and extant plants. Monocots have one cotyledon (seed leaf) at germination. Monocots usually have flower parts in threes, one aperture or furrow on their pollen, parallel leaf venation, a scattered arrangement of vascular bundles, and usually no secondary woody growth. Grasses and palms are well known examples of monocots. 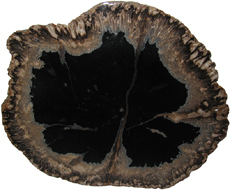 Petrified plam wood or Palmoxylon is the state stone for Texas and the state fossil for Louisiana. 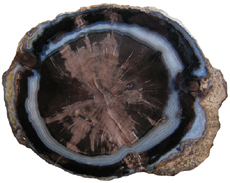 The state stone for Mississippi is petrified wood and much of the fossil wood found in the state is Palmoxylon. Dicots have two cotyledons when they germinate. Today there are six times as many dicots as monocots. Dicots usually have flower parts in fours or fives, possess three apertures on their pollen (except the magnoliids, which have one), netlike leaf venation, vascular bundles arranged in rings, and commonly have secondary woody growth (Willis & McElwain, 2002, pp. 156-157). 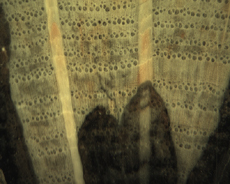 Woody dicots possess eustele stems; a central pith surrounded by secondary wood and bark. Woody deciduous trees such as oak, elm, and maple are good examples of dicots. 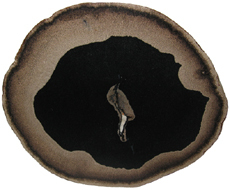 When looking at permineralized wood in cross-section one can quickly distinguish between gymnosperms and angiosperms with a 10x loupe. Most angiosperms have two cell types that are distinctly different in size. The large, water conducting cells, are called vessels; the smaller diameter, more abundant cells are fibers. 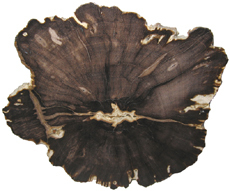 Gymnosperm wood is made of small diameter tracheids. 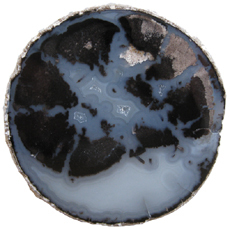 Tracheids are more easily seen with a 20x loupe. Angiosperms also have tracheids for water conduction. Among the angiosperms we can also distinguish between dicots and monocots. Dicots have their vessels and fibers arranged in rings while monocots have their vascular bundles scattered throughout the stem giving a speckled appearance even to the naked eye (Kenrick & Davis, 2004, p. 74). The first angiosperms had small seeds, which may indicate they were small herbaceous weedy generalists (Willis & McElwain, 2002, p162). 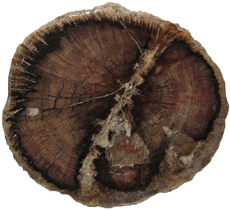 The lack of angiosperm wood in the early Cretaceous would also support the idea that the first flowering plants were small herbaceous plants. Fossil evidence from flowers, leaves and pollen suggests that dicots evolved before monocots. Cladistic analysis indicates a close relationship between Bennettitales, Gnetales and angiosperms (Willis & McElwain, 2002, p. 184). The diversification of flowering plants during the Cretaceous helps to mark a significant change in the world's flora. 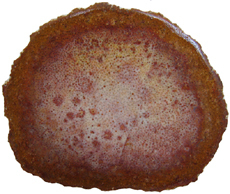 Paleozoic flora was dominated by ferns and clubmosses (Paleophytic flora). 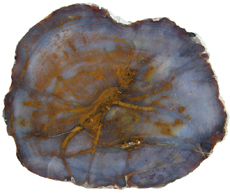 The Paleophytic flora gave way to a Mesophytic flora during the Triassic period. 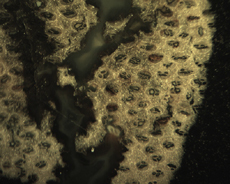 Woody seed-bearing plants and their relatives dominated Mesophytic flora. Thus, the change from Paleophytic to Mesophytic represented a change in reproductive strategy; from spore producers to seed producers. Conifers, cycads, and ginkgoes diversified during this time and dominated the landscape. Flowering plants first emerge during the Early Cretaceous and undergo a great adaptive radiation during the Middle Cretaceous. Flowering plants quickly became a major constituent of species diversity and the world entered the third great age of plant life known as the Cenophytic by the Late Cretaceous (Kenrick & Davis, 2004, p. 143). The transition from Mesophytic to Cenophytic represents a change in reproductive strategies. Gymnosperms and their relatives relied mostly on wind pollination and bore naked seeds clustered in cones or on the end of stocks. Flowering plants coevolved with animal pollinators, underwent double fertilization, and encased seeds in a fleshy ovary that encouraged seed dispersal. Our modern plant world is a continuation of the Cenophytic age of plants. 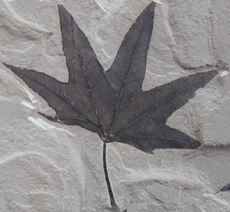 The 2016 Science Olympiad Fossil List includes three genera under the phylum Anthophyta (Flowering Plants): Acer, Populus, and Platanus. Acer is the maple genus. Today maples are an important part of the deciduous hardwood forests of North America. Maples are important economically as a source of hardwood and syrup. Maples are also used as ornamental shade trees (Elias, 1980, p. 775). Populus includes familiar plants such as poplar, cottonwood, and aspen trees. Platanus includes sycamore and plane trees. 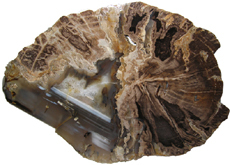 In the section titled "Other", petrified wood is listed, which does include flowering plants.